The BTM's primary aim is to support Brooklands Museum by subscriptions and fundraising. An important part of that work is reaching out into the community to help spread the word about Brooklands and to encourage people to visit and hopefully join up as members themselves. You will find us at most large Brooklands Museum events with a stand in the Paddock - there you can find out about the history of Brooklands from our displays and chat to the Outreach Team members about the Brooklands and the membership. We'll usually have a display of vehicles relevant to the particular event on the stand as well as our fundraising tombola and "lolly" game. The Outreach team take our gazebos and displays to a number of shows away from the Museum each year. 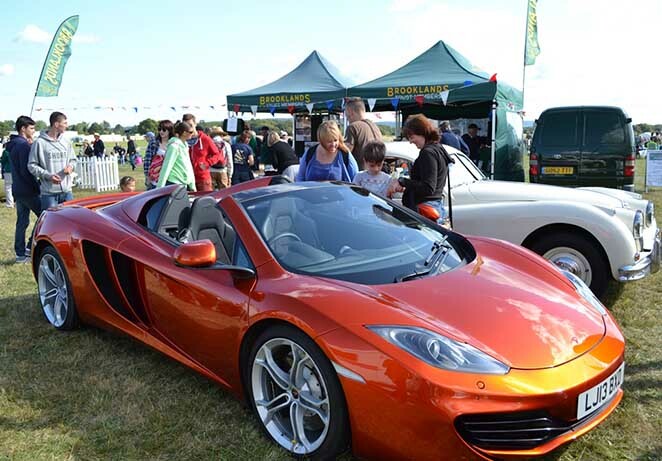 Shows and events such as Uxbridge Classic Car Show, Cobham Heritage Day and Shere Hill Climb. They also support the Museum at the main Wings & Wheels event at Dunsfold Park with a large stand and display. 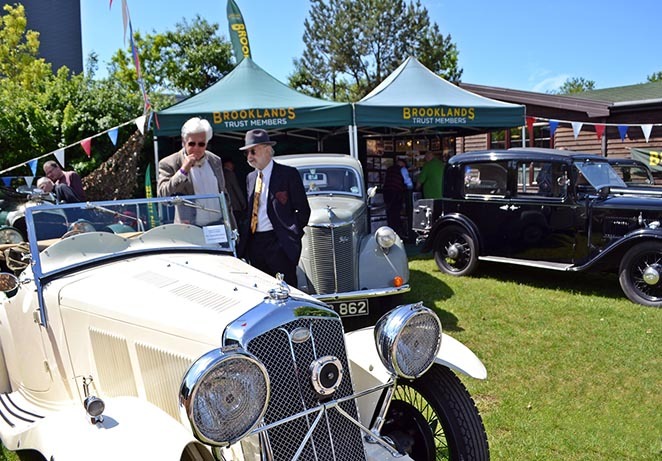 The Team has a "showcase" event each year at the Cranleigh Lions Classic Car Show where they have their biggest stand of the year featuring Members' vehicles as well as demonstrating the vehicles and talking about Brooklands in the arena itself. We give talks to outside groups and societies such as History groups, Care homes, Rotary clubs, car clubs and similar. Our head administrator, Tim Morris, delivers the talks with a fully illustrated powerpoint presentation. Click here for further information on the Outreach talks. Cranleigh Lions Classic Car Show - the Outreach Team's "Showcase" offsite event. You may like to help out on the stand or by bringing your classic to one of the shows. To become part of the Outreach Team you need to be a Member who is outgoing with a good knowledge of Brooklands as you will be talking to the public about the Museum and Membership with a willingness to travel to shows away from Brooklands at weekends. If you would have a classic vehicle and would like to display yours with the Outreach team then please get in touch. 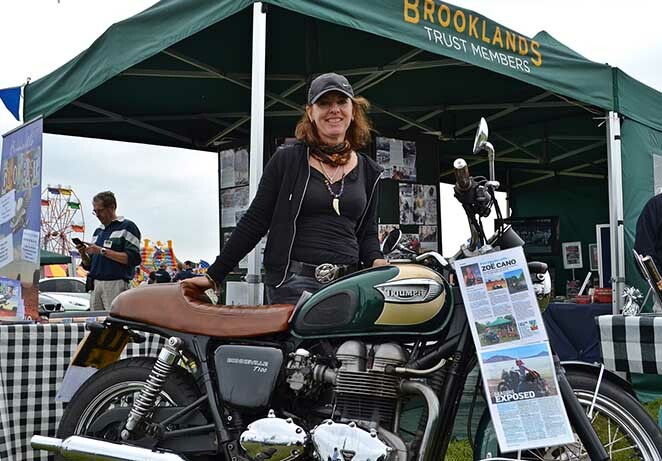 Motorcycle adventuress and author Zoe Cano often shares our Outreach Stand with us and will be doing so again this year.